The British AA gun is a 9-cwt because the barrel is longer than the buffer, whereas in the 6-cwt they're a similar length - compare this photo with my post of the gun from 98th AAS. There were only a few 9-cwt guns in Salonika. 73rd AAS had three 6-cwt and one 9-cwt. 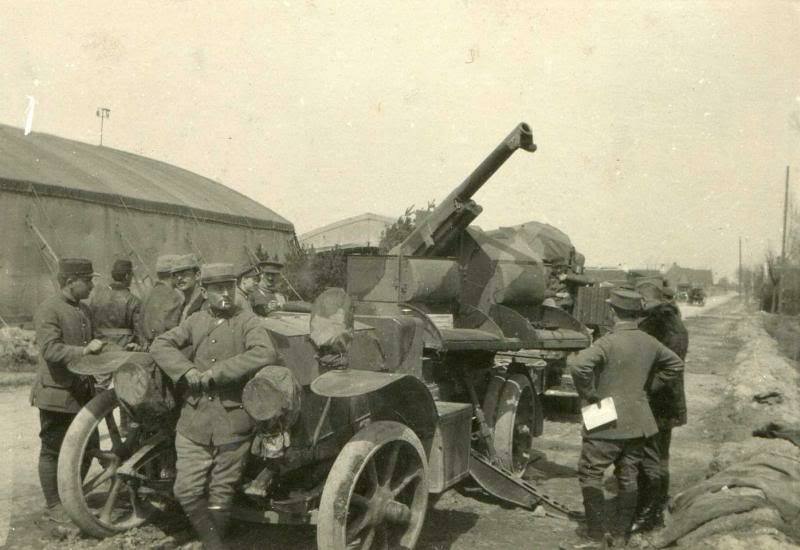 90th, which arrived in early 1917, had two 9-cwt guns. 91st, which came at the same time, may have them but there's nothing mentioned in the Diary. I don't think it's that one, though, as it spent all its time in the Struma, which is al but flat. The other candidates were only formed at the very end of the War and saw no significant action. I don't think it's 73rd AAS because their position, on the ridge above Dudular, would put the hills further away. That leaves B Subsection of 90th AAS, which was always in the hills behind the Doiran front. It would need someone who knows the area better than me but the sites the Sub spent most time at were at Oreovica, Causica and Kirec. The French gun is what they called artillerie anti-aerienne demi-fixe. We didn't have a direct equivalent. This is a semi-permanent AA position that would be built more quickly and more cheaply than a permanent position, which would be built in concrete I would say that they would be used at sites where the possibility of movement existed but was relatively unlikely, such as an airfield. A hole was dug and reinforced with brushwood and other local materials. A frame was erected to take a soixante-quinze. It would certainly be better than the French auto-canone - equivalent to our gun-lories - because it could be rotated through 360 degrees and because the elevation was close to vertical as can be seen. I can't see anything to turn the platform so I'd imagine that the rotation would be carried out manually by the detachment. Many thanks for the information on the Salonika AA Units, and the French Auto-Canone. 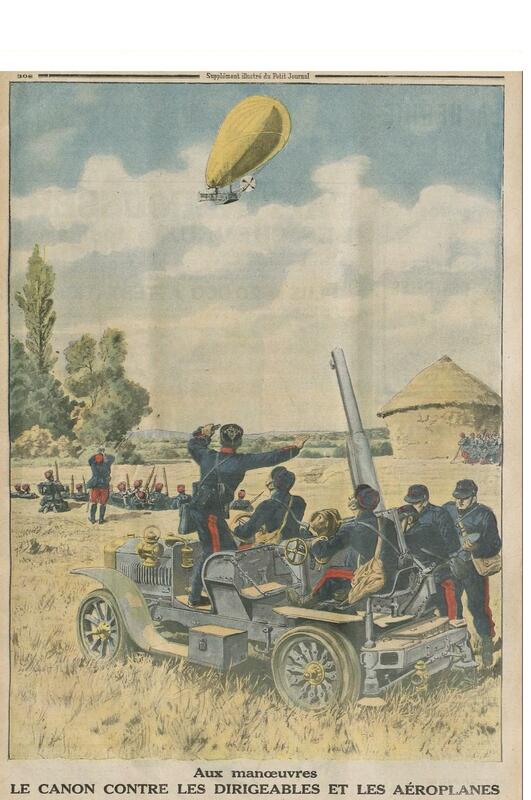 A French 75 mm Auto-Canone in action mounted on a De Dion Bouton vehicle, along with its service vehicle, and a nice period coloured illustration of a French Auto-Canone in action attacking a German airship. The British bought a number of auto-canons at the start of the war to help defend London against the threat of German airships. 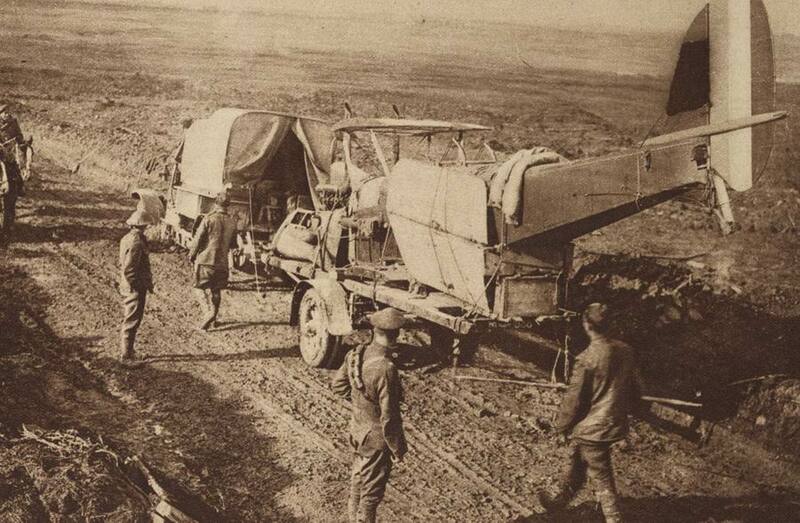 The idea was that they could be driven to the route the airships were taking and fire from unprepared positions. 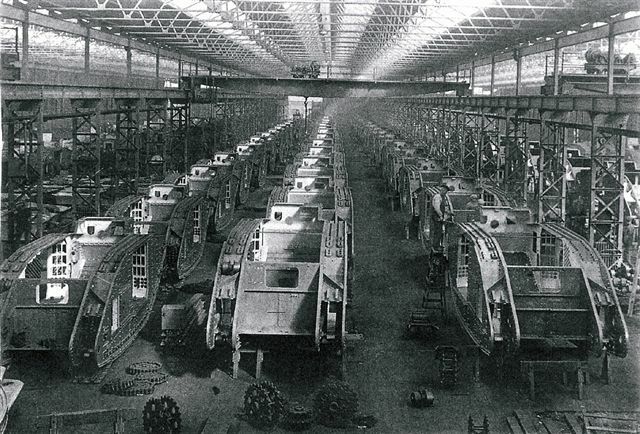 Some were on the normal, De Dion chassis and others had the pieces fitted to a number of chassis on a mounting designed and built by the Coventry Ordnance Works. The French design has the piece mounted at the breech end while the COW design mounts it at the centre of balance. Hogg and Thurston says that the elevation of the auto-canon was 70 degrees and the traverse was 120 degrees either side of the centre-line of the vehicle. By eye it looks more like 90 degrees! The drawing shows how careful we must be if such illustrations are our source of information. The elevation is too high and the position of the mount on the chassis is too far forward. If they fired it as drawn the breech would slam straight into the jacking mounting at the back. Oh, yes. And the jacks aren't down. That officer is about to get projected into the air as the car bucks during firing. It is called ' Artistic Licence ' , nonetheless, it is an extremely nice item of WW1 artwork. The British bought a number of auto-canons at the start of the war to help defend London against the threat of German airships. Here we see a group of both French and British officers discussing a French Auto-Canone. It looks as if that one is in a long-term position as the headlights are covered. It also has its front jacks down even though they aren't firing. 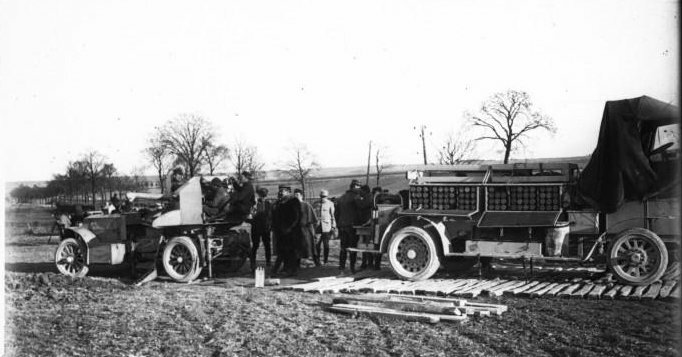 The other photo of an auto-canon and support vehicle shows that they did have screw-down rear jacks as shown on the illustration. Allowing for artistic licence, the sketched vehicle is too short and is missing the front jacks. You're dead right that the artwork is wonderful. It's just not very realistic and I was only pointing out the dangers of taking anything that isn't a photo as the basis for what something looked like in detail. At the end of the day <chuckle>, it's only an AA nerd like me that this would even register with! It looks as if that one is in a long-term position as the headlights are covered.detail. At the end of the day <chuckle>, it's only an AA nerd like me that this would even register with! The buildings on the left in the photograph could be hangers, or some other military installation being protected by that Anti-Aircraft Gun. As to being an AA nerd, at least you know exactly what you are talking about, and this Thread is the better for your substantial knowledge of AA Guns. 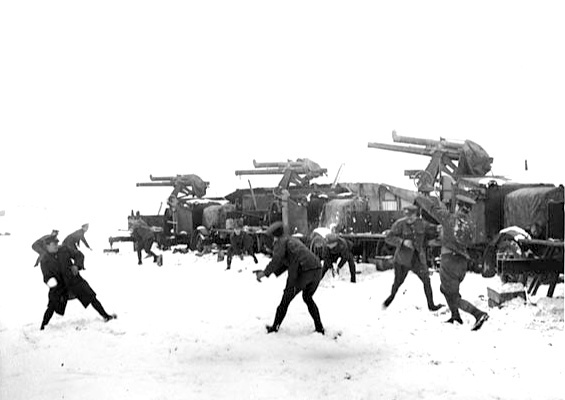 Members of a 13 pdr Anti-Aircraft Gun ( mounted on Thornycroft Lorries ) unit, relax with a snowball fight somewhere in France. 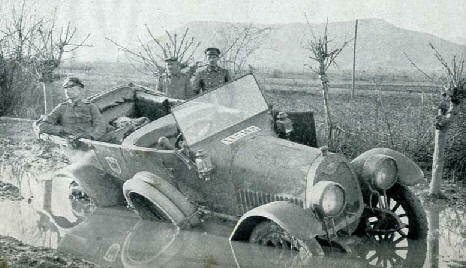 It was not just British vehicles that got stuck in the Salonika mud, here a German staff car's driver seems to have underestimated the road conditions, however the German officer in the back of the vehicle remains resolute. 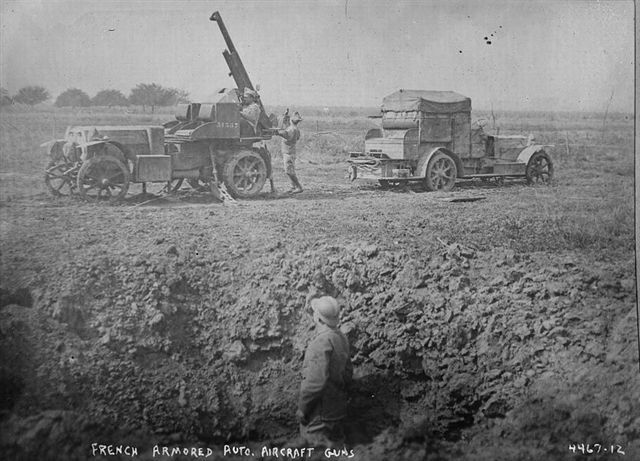 Photograph showing a French 75 mm Anti-Aircraft Gun - Auto Canone - in action, along with its support ammunition truck, which clearly shows the storage method for the shells. 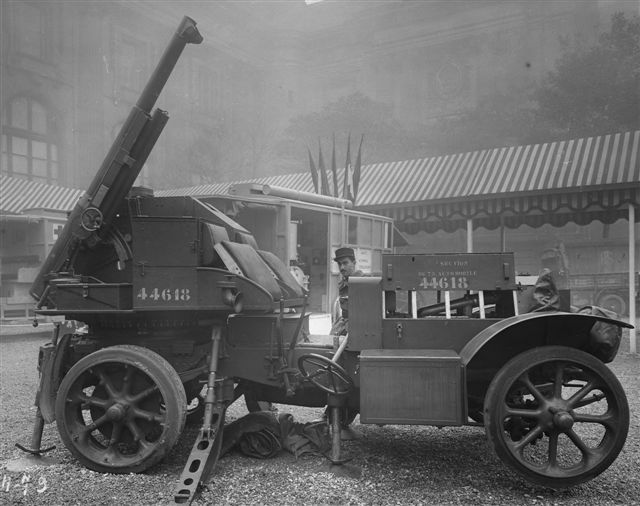 A very informative photograph of a French Auto-Canone Anti-Aircraft Gun, mounted on a De Dion Bouton vehicle, standing in a long-term position, with its headlights covered, and the jacks down. Also, from the particular angle this photograph has been taken, there is the unusual view clearly showing the vehicle's steering column and steering wheel having been lowered to create additional room in the driver's cab area. This is the first photograph I have seen, which clearly shows this re-positioning of the the steering column and steering wheel while the gun is in ' ready for action ' mode. Ah! Bingo! I said earlier in the thread that I couldn't see how they got to 120 degrees of traverse either side of the centre-line of the vehicle but this shows precisely how that was done. The two seats are part of the gun mounting and will rotate with it. The steering wheel has to be movable so as not to obstruct the carriage at the limit of movement. In Post 636, although there are men sitting on the carriage it isn't firing. It took me ages to find the barrel - almost horizontal and pointing over the bonnet. In Post 638, there is a depression on the sloping part between the seats that looks as if that's where the barrel sat when on the move, meaning it would have been between the driver and his mate. I wonder if the large boxes behind the mudguards are ammo boxes and the support vehicle acted as a limber? In Post 638, there is a depression on the sloping part between the seats that looks as if that's where the barrel sat when on the move, meaning it would have been between the driver and his mate. 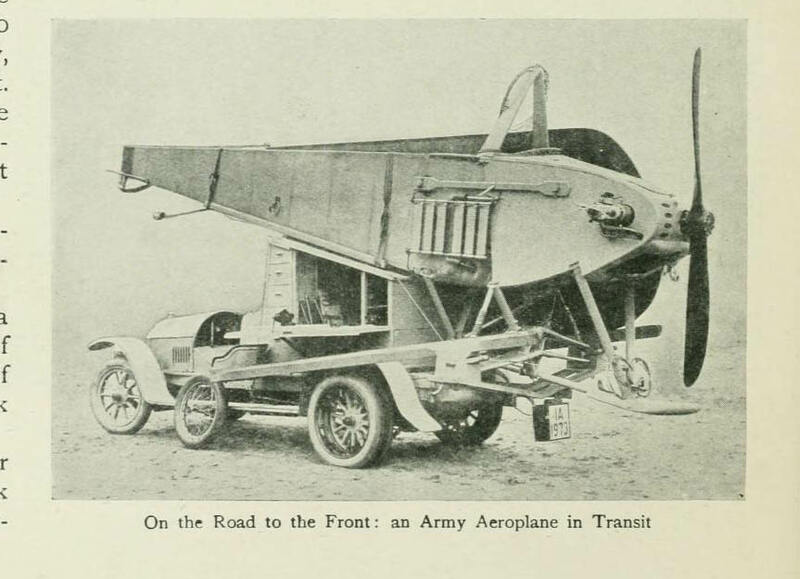 Here is a photograph showing the gun barrel lowered, facing forward and stowed between the two cab seats, presumably this was the ' transportation ' mode for the gun. Also, I found another smaller coloured photograph, again taken at an angle which shows the steering column and steering wheel lowered during action. As yet, I have not found any information or photographs of what those large boxes behind the mudguards are for, or what they contained. 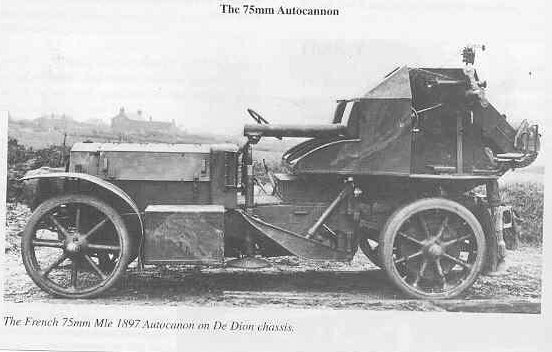 I have seen two WW1 films of the Auto-Canone in action, and in both films, this quick firing gun is continuously feed shells by crew from behind the gun, presumably from its ammunition truck/limber. However, those boxes could contain a limited amount of ammunition for emergencies. An RFC Tender towing in a damaged aircraft for repair, from the aircraft's distinctive raised twin engine exhausts, it looks to be an RE8. Also, the aircraft's tail identification numbers appear to have been blacked out. 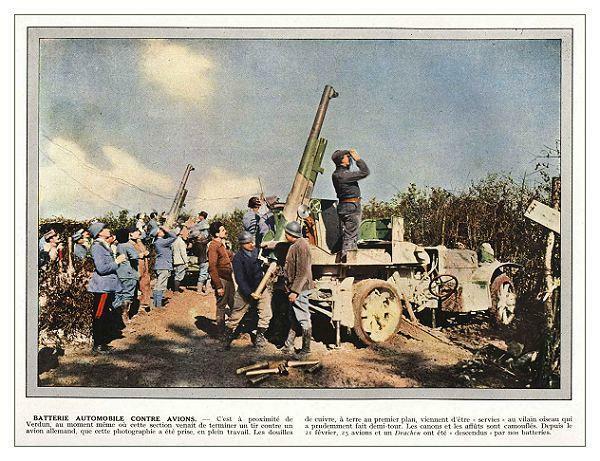 The French AA gun differed from the British in being fed, as you say, by men standing on the ground whereas the British stood on the lorry's platform. It probably meant that fewer men were needed for a French detachment because we needed people on the ground to set the fuses and number on the platform to receive the shell from them. We also had separate people for elevation and traverse control but there doesn't seem to have been enough room on the French carriage. I wouldn't fancy sitting on the French lorry while on the move. I suspect the driver and his mate were black and blue where they'd banged into that barrel! Great photograph, looks at though the vehicle has a custom made platform to take the aircraft. Hopefully, someone will know the type of aircraft being transported ? Looks like a maybe a few spares in the drawers and a workbench form part of the bolster? Interests:West & East Haddon, Ravensthorpe and Guilsborough Lads (Northamptonshire) 1914 - 1918 who did not return home. What a fascinating thread - thanks! Pleased to hear you are enjoying this Thread. 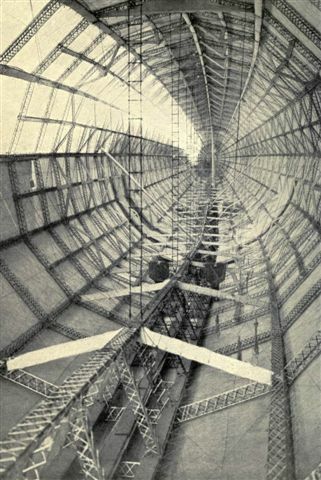 2 photographs which aptly describe ' vast ', a tank production factory floor, and the interior of the German Naval Airship L30. 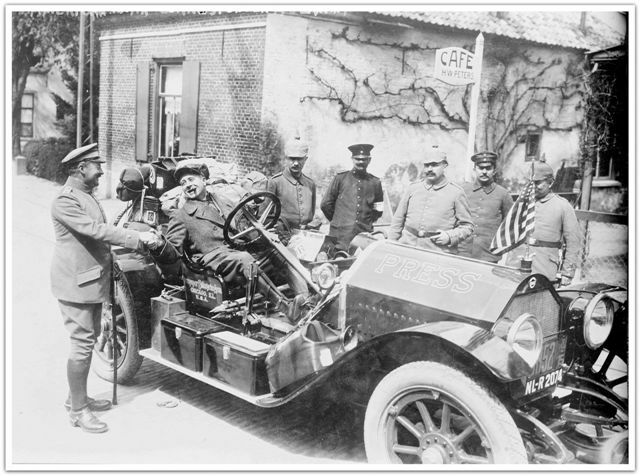 In a photograph taken prior to America's entry into WW1, we see an American War Correspondent from Chicago Illinois, U.S.A., in his wonderfully equipped ' PRESS ' vehicle, complete with the American flag, chatting with German troops.